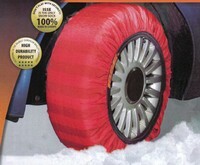 Revolutionary snow sock for winter snow and ice conditions. If the road gets snowy, slippy and you lose traction or slide, then fit a pair of these on your driven wheels and you will achieve instant traction and be able to drive through snow safely, bypassing stranded motorists who didn't prepare for winter. They are reuseable provided you remove them in normal conditions. Carefully note your tyre size and order accordingly.